How to persuade citizens to enlist? How to convince them to fight in a war which was, for many, distant in terms of kilometres as well as interest? 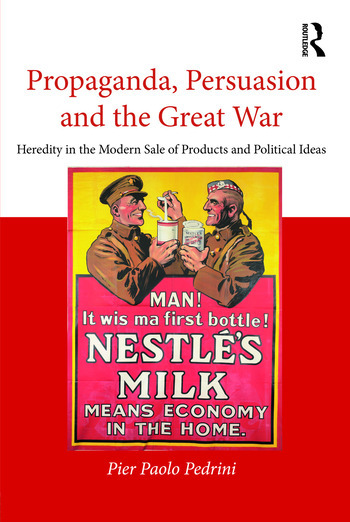 Modern persuasion techniques, both political and commercial, were used to motivate enlistment and financial support to build a "factory of consensus". The propagandists manipulated the public, guiding their thoughts and actions according to the wishes of those in power and were therefore the forerunners of spin doctors and marketing and advertising professionals. Their posters caught the attention of members of the public with images of children and beautiful women, involving them, nourishing their inner needs for well-being and social prestige, motivating them by showing them testimonials in amusing and adventurous situations, and inspiring their way of perceiving the enemy and the war itself, whose objective was to "make the world safe for democracy". In the discourse of this strategy we find storytelling, humour, satire and fear, but also the language of gestures, recognized as important for the completeness of messages. Were the propagandists "hidden persuaders" who knew the characteristics of the human mind? We do not know for certain. However, their posters have a personal and consistent motivation which this book intends to demonstrate. Reciprocity. I am fighting for you! Pier Paolo Pedrini teaches Techniques of Persuasion for the Masters Program in Public Management and Policy at the University of Italian Switzerland, Psychology of Communication at the Institute of Continuing Education and at other advanced schools. A researcher at the Ecole Nationale de l’Administration Publique (Université du Québec en Outaouais, Gatineau), he is also an advertising agent and a consultant for marketing and advertising.